This year marks the year of our first Sudbury client! We were very glad when Merrill found us (through a rather complicated way) and signed up for letterpress wedding invitations. 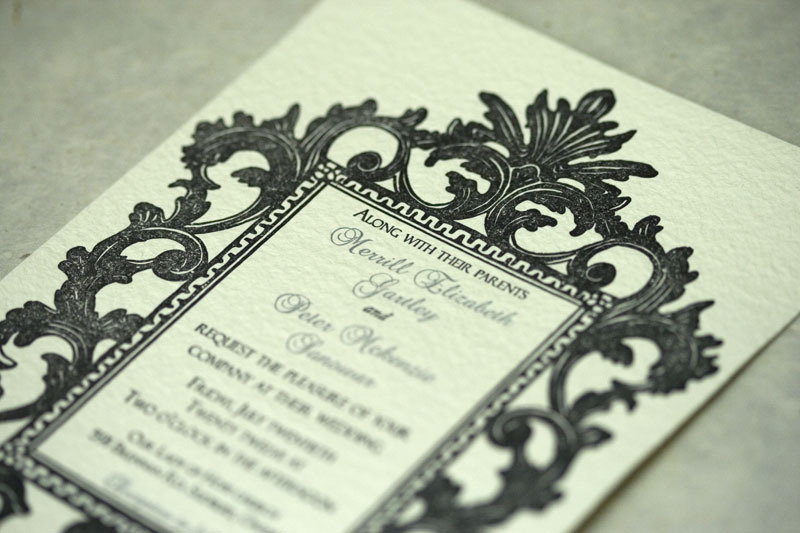 She chose our Wrought Iron invitation to be printed in black and metallic silver, on St-Armand Ivoire and matched with a deckled envelope. 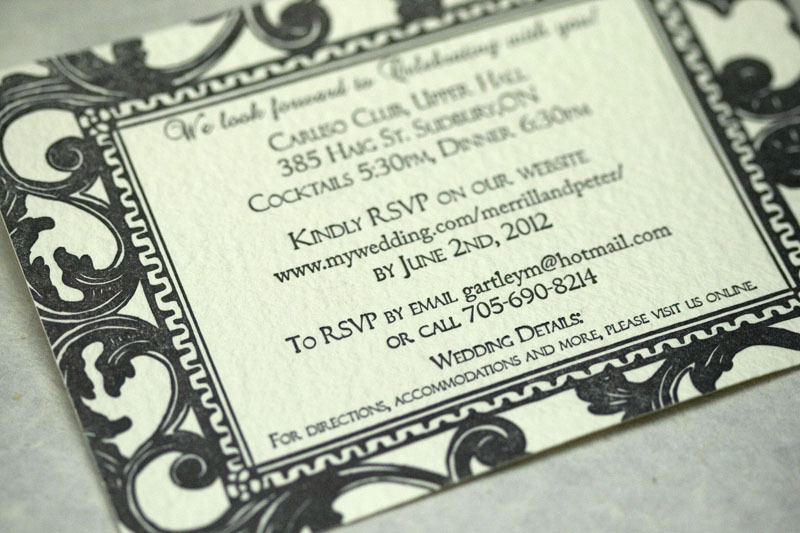 A note on handmade papers: This was the first invitation suite we printed on St-Armand handmade paper. However, we’ve since removed St-Armand papers from our paper list simply because of the level of difficulty in trimming handmade papers. Most handmade papers do not have machine-cut edges, meaning the sheets are all different sizes and this makes trimming difficult. Also the rough surface quality of the St-Armand paper meant that it had to be dampened before printing to ensure that the solid areas of colour printed well. 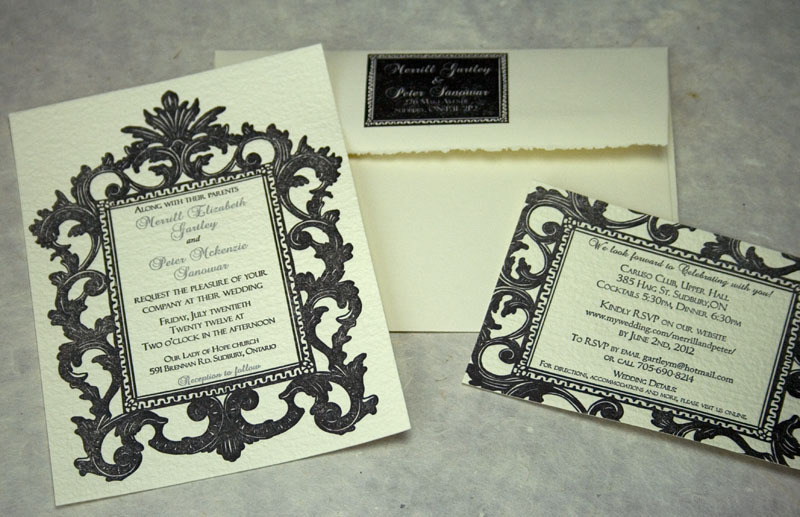 Merrill and Peter’s invitation looked fantastic, but all in all it was too much trouble to trim and print for us to continue using St-Armand papers for letterpress jobs with large quantities.